However, I still wasn’t sure it was quite ready to submit. So I just sat on it. Time happened, in its way. I read a lot. I did a couple of short writing courses. I didn’t think about that novel at all. I tried to write another one. Then tried to focus on other things. But then a deadline looms on the horizon: The Ampersand Project. And I start to think about that novel again. I think about what I’ve read in the meantime. I think about what I learned from those short courses. I think about what I’ve been learning from books on writing. And I come to realise something. Even though no one has read that latest draft, even though I was convinced that I couldn’t do another thing to it without the guidance of someone else, even though I’ve not read it since I finished working on it months ago, I know that it need work, and that I’m the one to do that. It’s not done yet and I need to revisit it. Something that I couldn’t believe before. Something that I needed some space to realise, first hand. And so that’s what I’ll do. 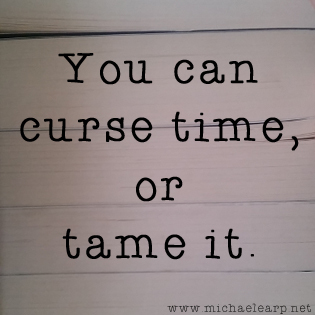 I’ll tame the time as it dances from my grasp and tame my manuscript while I’m at it.